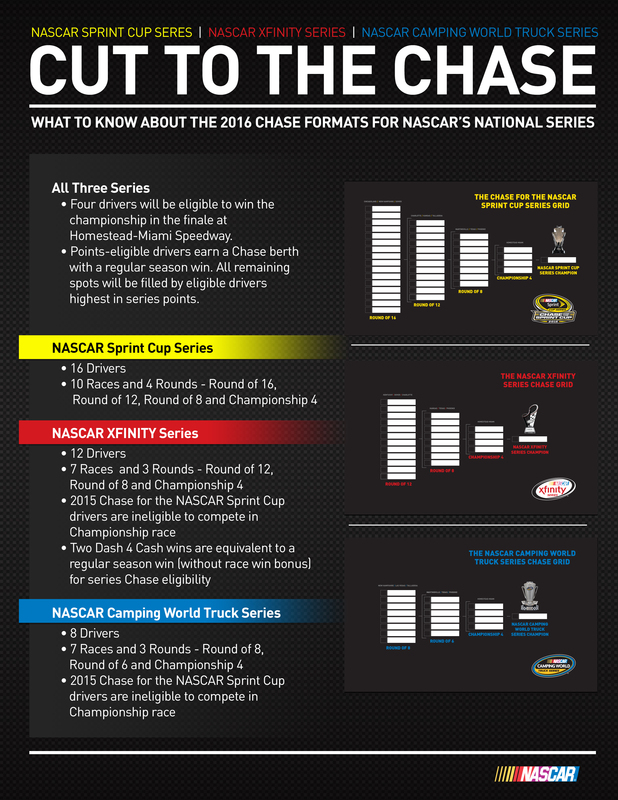 2016 NASCAR Fun Facts & Changes to Hit This Season – What are your thoughts? Alright, so there has been plenty of time by now at least to get updated on what all is going on around the NASCAR community. Other than the fact that we are just a few short weeks away from racing – makes your heart all warm and fuzzy doesn’t it! If you have been keeping up with Race Hub, or NASCAR Radio, or even following along on various social media you have seen quite a few changes to the sport we love. Chase formats for the second and third tier, caution clocks, rules package changes, and the most recent change, the charter system. We all knew this was coming at some point in time. If you didn’t then you probably live under a rock or, simply just did not want to accept the fact. 36 teams were issued what NASCAR is calling a “Charter,” this is a 9-year agreement between the teams and NASCAR and it guarantees you a starting position in EVERY race on the Cup circuit. The foundation of the system was built on three key components, as stated by Rob Kaufmann in a press conference earlier this week, participation, economics, and governance. The teams that were issued a charter were done so based on evaluation over the last three’s of the teams performance. Yes, team owners had a say in the system itself, but not who were given the charters. The charters, much like any type of business or property in the world, can be bought, sold, and even transferred (only once per car per five year period). See folks, before you jump on he high horse of “NASCAR is going down the shitter,” or “All these changes are stupid,” take a step back, and a deep breath and realize there are people in place to think of this stuff. In addition teams will have to remain competitive to keep these charters as NASCAR has made that clear that is one of the stipulations. In addition to the 36 charters, NASCAR has also slimmed the starting grid up just a bit for the 2016 season. Gone are the days of the 43 car field AND the champions provisional. Don’t go throwing a fit just yet, its not like they tried to take your lollipop away! 40 cars will now take the green flag every Sunday afternoon, as well as some Saturday nights creating one hell of a race between the “Open Teams,” a term being used for those race teams who were not awarded a charter. Qualifying will still set the pole and the rest of the field. The 36-chartered teams are guaranteed a starting spot while the four fastest Open Teams will fill the holes. What happens when it starts raining you may ask? Don’t worry; the smart folks over at NASCAR have you covered. In a statement from NASCAR, “If qualifying is cancelled due to weather, the combined practice speeds determine the four Open teams. If practice and qualifying are cancelled due to weather, Owner points determine the four Open teams (events 1-3 revert to 2015 Owner points).” See not so bad right? Pretty much what we have now. Out of all the changes made over this off-season this may be my only gripe. Mainly just because of the name. The 2016 circuit will now feature an Overtime Line… yes I am not making this up, almost as interesting as the caution clock – which we will get to! For all three NASCAR national series, a race may be concluded with overtime, consisting of a new procedure for a green-white-checkered flag finish featuring an “overtime line.” The location of the overtime line will vary by track. I get it, I really do! Its all in the name of safety. A lot of this rule comes from what happens at the bigger tracks where we are more likely to get the bigger wrecks, especially when your coming down to the last 2.5 miles. Overtime Line though? Really? I wonder if it will come with its own fancy colorful line like the first down marker in football, or how back in the day the hockey puck glowed blue. Honestly it was only a matter of time before this happened to NASCAR’s lower tier division. At the same time I see no real issue. Yea, it took time for some to get used to it on the Cup level, but you cant really say that it has not added some great drama to the series. People will argue all the time that it takes away from points racing, and what the point of racing hard throughout the rest of the season after I already get my win and locked in the chase. Well that’s simple – BECAUSE YOU ARE A RACER! Look at regular seasons in your typical ball and stick sports, and before anyone goes on the tangent of NASCAR is not a stick and ball sport, yes I am aware of this! Teams compete in a regular season with the idea to make it to the play offs. How they do in that regular season sets them up for either a bit of an easier road during that play off time or a difficult road. Look, we don’t need to make this sport any easier, if we do where is the fun in that. Then guys like me can land in some money and go out there and race. I know the argument of well you can go out there and have a five or six win season and still not win the title. Yea that’s true and look at the Carolina Panthers this year, only lost one time and still did not when the championship. It’s the drama that comes along with sports, its one of the main reason why we watch. This year the Xfinity & Truck series will both have their very own chase format. The break down of the format (drivers, rounds, qualifications, etc.) can all be found in the graphic to your left. 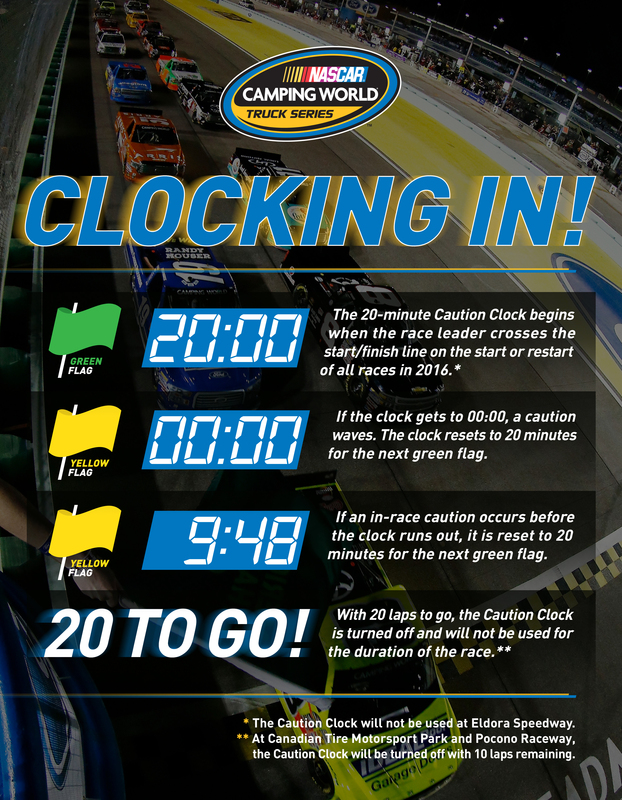 For 2016 the NASCAR Camping World Truck Series will have one heck of an interesting new rule – The Caution Clock! Very simple but apparently rubbing a lot of people the wrong way. A 20-minute clock will be set prior to the race and will begin to count down at the drop of the green flag. If the race goes caution free at the end of those 20 minutes NASCAR will throw the yellow flag. If for what ever reason there is a yellow flag in between that time the clock will then be reset and continue to count down the next 20 minutes. This will not change the amount of tires NASCAR gives to the teams, nor will it change the amount of laps. What it will change though is strategy! Since NASCAR made the announcement that they will be implementing this rule I have heard a lot of fans complain how it is manipulating race, allowing NASCAR to pretty much, and I am paraphrasing here, pick who the winner is. A lot of complaints came into various talk shows and social media platforms that I follow about it punish the leader. Which in my opinion is really the only thing I agree with. If you have the truck to come to the track and in five laps put fifteen seconds between you and I for first and second, that shows you got your stuff together and you didn’t come to play. On the flip side to that if you did it at the start of the race, you can do it again. Lets put it this way, and she is my wife so I don’t feel bad mentioning this, 2015 was the first time we went to Charlotte Motor Speedway. At one point during the race, kind of towards the end when everyone was playing the fuel game, I caught her nodding off. In the grandstands, going into turn one where the cars were hitting all of 190 MPH. Why was she nodding off? Because the field was so strung out and guys were out there just riding around. The caution clock will eliminate that possibility in the truck series because at least every 20-minutes you are gonna have the guys and girls up on the wheel digging on that restart. Now I know not everyone out there will agree with my thoughts, and honestly that’s what I hope for! I am just one person with one opinion. I like to hear your opinions. The main goal of this story was to sum up some of the major announcements from NASCAR as we inch closer and closer to the start of the 2016 season. I also wanted to get your opinion on these rules. Maybe suggest something that you would change and why. Emphases on the why! Make sure to leave a comment bellow and give us a follow so you can receive an email every time we post new content. The easiest way to stay updated on your favorite driver, series, and track!